Since Victorian times, humans have devised a method of creating illusionary ghosts. 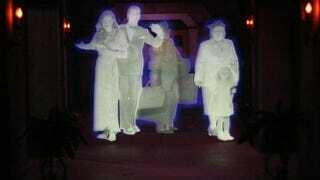 This illusion, known as Pepper's Ghost, was used at carnivals and might be a great addition to your haunted house. Magic tricks are referred to as "smoke and mirrors," but the real trickster here is light. Light fools people into believing that some images are three-dimensional when they're flat on a screen. Light tricks people into imagining that objects underwater are nowhere near where they actually are. Light is the ultimate illusionist, and with Pepper's Ghost, and the mirrors are just along for the ride. Panes of glass are supposedly see-through, but most of them are at least partial mirrors. They reflect back some of the light that hits them, which is why we often see our own reflections in the windows of stores and houses (just before we heave a brick on through for that sweet, sweet looting). This never works when there is light on the other side of the glass (and not just because bright lights signify that it's a bad time to loot). The flood of light through the windows drowns out the "ghostly" image of the reflection. John Henry Pepper saw this and figured out how to rig it on stage. A section of plate glass was placed on a dark stage. If a spotlight shone on a person standing in front of it, the light from that person would hit the glass, and some of it would reflect back. The bright areas would glow and look opaque, but the dark areas would look see-through. Because people are used to light traveling in straight lines — and because glass is for the most part transparent — viewers would interpret this light as coming from behind the unseen glass instead of a reflection. If the lighted person is ten feet in front of the glass, the people would see the "ghost" as being ten feet behind the glass. Of course, the illusion doesn't work if people can see both. If you angle the glass at one end of the stage, keep the edges of the glass concealed, and hide the brightly-lit person at the other edge of the stage behind a curtain, the audience will only see the "ghostly" reflection. The angles have to be just right. If the audience is too much to one side or another, the ghost will be cut off at the edge of the pane of glass. As long as the angle of the viewer is controlled, they'll see a ghostly figure. A few lights or subtle mirrors and the "ghost" will be able to see them as well and interact with them in real time. It just takes a little practice setting up the angles, using fabric to block off the ambient light from the spotlight, and keeping the audience in one section of the room. Of course, to set one up in your house you'll have to have a large pane of glass. If you only have a small one, I'm sure a ghost hamster in a corner will be just as spooky as a human. Top Image: WillMcC. Second Image: Eric Pierce Via The Naked Scientists.